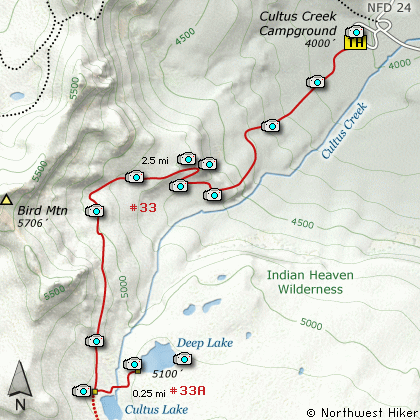 This is another hike that begins in the Cultus Creek Campground. Follow Trail #33 as it climbs steeply out of the valley. In the first mile you will gain several hundred feet in elevation. A few well placed switchbacks make the climb easier. At about 1 mile you will come to a sharp switchback with a view. From here you will be treated to an outstanding view of Mt Adams to the northeast, with Sleeping Beauty just below it to the right. The Goat Rocks can be seen to the north, and Mt Rainier to the northeast. The trail climbs more gently for the next mile as it wanders in and out of forested areas. At about 2 miles you will be right below the ridge line of Bird Mountain. A half mile later you will come to the junction of Trail #33A which takes you to Deep Lake. The trail to deep lake wanders up and down and in and out of forested areas before it reaches the lake. When you come to the lake, take time to explore all shorelines. 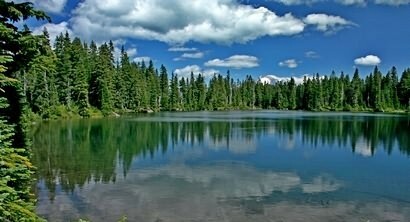 The best views are probably from the south and southeast side of the lake, where you can see Mt Adams peeking over the forested northern shore of the lake.